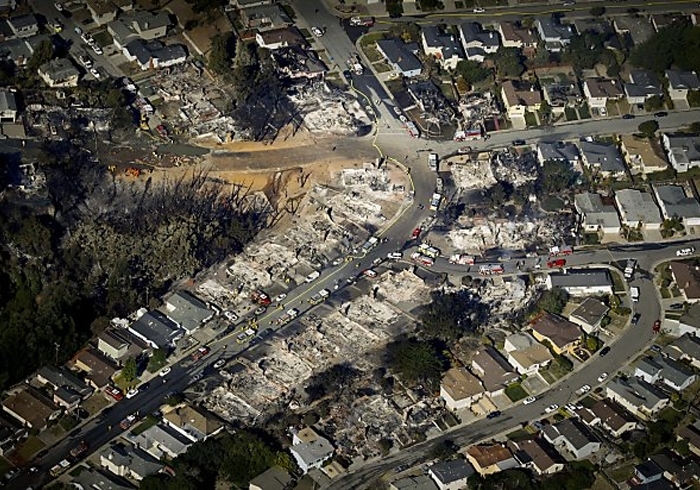 PG&E Corp. expects to pay at least $200 million in fines tied to the deadly 2010 San Bruno pipeline explosion, company executives said Thursday. The figure is PG&E’s first public estimate of the amount that state regulators could fine the company and its utility, Pacific Gas and Electric Co., in response to the blast, which killed eight people and destroyed 38 homes. And PG&E executives warned that the estimate represents a bare minimum – not the likely total. The California Public Utilities Commission is pursuing three separate investigations triggered by the natural-gas pipeline explosion, and each investigation could lead to fines. In January, the commission also fined PG&E $16.8 million for failing to conduct required leak surveys on part of the company’s gas- distribution network in Contra Costa County. Consumer advocates, however, say the fines will need to be far larger to change PG&E. A series of government reports have blamed the San Bruno tragedy on the company’s sloppy record keeping, lax attitude toward safety and history of spending pipeline operations money on other things, possibly including executive bonuses. PG&E executives gave the penalty estimate on Thursday while announcing the San Francisco company’s 2011 profit, which dropped 23 percent from the previous year to hit $844 million. PG&E spent $483 million last year on pipeline safety tests and other work prompted by the San Bruno tragedy, an amount that will probably increase in 2012. The company estimates that by the end of next year, it could spend from $1.6 billion to $1.7 billon responding to the blast – all money that would come out of shareholder profits. San Bruno’s aftermath has cost the company and its shareholders about $546 million to date. In addition, PG&E has asked the utilities commission to approve spending $2.2 billion more to improve its natural-gas system, with about 90 percent of that money coming from customers’ monthly bills. The plan has outraged many politicians and PG&E customers, who insist that the company absorb more of the costs. The commission probably won’t vote on the matter until the end of this year, PG&E executives said Thursday. The company also tried to rebut claims made last week by two veteran welders, who told the utilities commission that PG&E workers testing the strength of the company’s pipelines last year had performed dangerously poor welds on some of the pipes. The utilities commission is investigating the complaints.